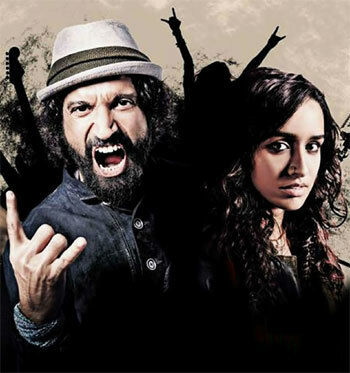 Rock On 2 is mediocre, warns Raja Sen. When Farhan Akhtar sees a fire, he glares at it. Also, if glaring at things would cause them to stop happening, the Rock On 2 screening I was at would have wrapped up roughly 15 minutes from the start. In this entirely unnecessary second instalment to an overrated original, Purab Kohli plays stilted narrator and drummer KD, telling us what the others are up to. Arjun Rampal's Joe looks suitably pained as a reality show judge, KD himself makes jingles that completely disregard the client's brief, while Adi (Farhan Akhtar), who appears to have moved to Meghalaya and discovered steroids, lies on his bed with flexed biceps and gasps at nightmares. This bearded Adi has done a lot, KD clunkily tells us, listing his noble accomplishments as if by rote -- 'farmers ka ek cooperative, bachchon ka ek school' -- but all this earnest ticking of boxes in and around Meghalaya isn't enough to bury Adi's demons. There is a death that haunts him, and he has chosen to live far from Mumbai, music and that band called Magik they once all played in. This, considering their on-stage autotuned caterwauling, appears a commendable choice to me, but every character and coincidence seems intent on dragging the cardigan-wearing Akhtar back onto stage where screaming fans knowingly mouth along to songs that have only just been written. Shraddha Kapoor pops up in the hills, recording Cherrapunji musicians performing what sounds more fascinating than anything on the soundtrack. She is a musician, a bohemian traveller who marches to the beat of her own drummer and so forth. This is perhaps why she disregards the song she is recording as soon as she sees a moody bearded man standing around looking downcast, and follows him instead. Rock On 2 is a mediocre film. It is far too emo, with a hideous subplot about an aspiring musician rejected by his classical musician father, one who wears a shawl as committedly and constantly as Thakur did in Sholay. It is a film where a drummer hops around while they are performing carrying one drum like a dafli. It is a film where everyone constantly addresses everyone by their first names, as if to make sure the audience doesn't forget. It is a film that creates random and unnecessary villains only to make the third act more dramatic, even though all it does is stretch out an already predictable film. The music is entirely unmemorable. Shankar-Ehsaan-Loy had a couple of riffs that caught the public imagination in the original eight years ago, but things are far more lacklustre this time. There isn't even a laundry bill to speak off, and -- save for a song performed by Usha Uthup alongside a North-Eastern band and brings out some goosepimples -- this film is built around a generic soundtrack to avoid. Then again, Magik is a band where musicians listen to a demo for a couple of seconds and decide that the singer has 'it,' without waiting to see the bridge of the song, or other tracks, or overall versatility, and so this does sound like the kind of muzak they'd make. Rampal, however, is pretty good. There is a wariness to his sighs, to his body language and to his overall tonality as he patiently deals with the petulant overgrown kids around him. I enjoyed watching him, grizzled and thoughtful and annoyed at being judged for judging. I'd almost say he knows what he's doing. Then again, he's in this film.